Following our short article by Tristan Hazel on homeless on the Portobello Rd., Emma Dent Coad puts RBKC expenditure in perspective. We know there are homeless people out there, thousands upon thousands of them, and we know there are rough sleepers. I have seen more and more tucked away in quiet corners of the borough over the summer, and left them to it; in warm weather it may be tolerable. Some rough sleepers have work of a kind (manual labour at a certain building site), some have come to the UK to work and found none, others have simply fallen off the edge. 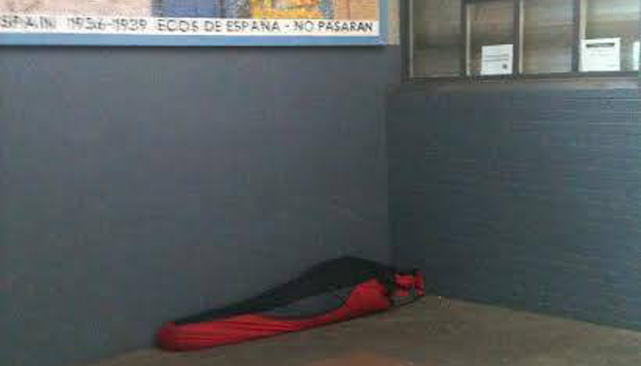 So I shouldn’t have been shocked by this photo, sent in by a resident, of a rough sleeper on Portobello Road, with one layer of wrapping, lying on concrete on the coldest night of the year, Friday 5 December. Now sensitised, while I am out and about I look out for bundles of blankets and cardboard, and see quite a few. Sometimes there’s a poor soul hidden inside. How many will survive this freezing weather? In a civilised society, in the self-professed ‘richest borough in the universe’ this is unforgivable. I have sat at meetings when Council officers backed by a pinstriped Cabinet Member have painstakingly explained how night shelters, lunch clubs, even food banks, encourage the hungry and un-housed to hang about in the borough. How unseemly! ‘Out of sight, out of mind’ and never mind where they will end up, half starved and rough sleeping. So, the churches fill in where they can, and thank God and all the gods for that. from its homelessness prevention scheme this year. 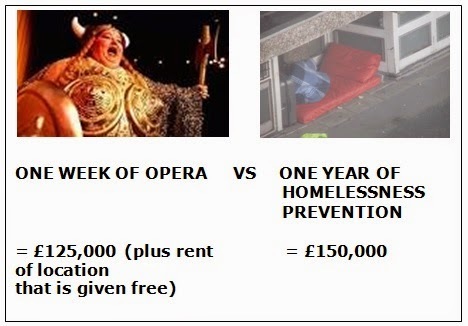 Yes, the Council that can justify handing over, no strings attached, £5m to a loss-making business, Opera Holland Park, that some say has cost us cc£20m since inception - a ‘business’ that loses up to £125,000 per week on its eight-week summer run – is CUTTING the price of a week of opera (if you add in the cost of renting the location at Holland House, which is given free), for a year of homelessness prevention. Any organisation that has been run inefficiently for years can make savings through better planning and tightening up on costs. But RBKC has taken this to a new level. While bleating ‘austerity’ and ‘tough decisions’ they have cut back on services, particularly focussed on the most vulnerable who cannot speak for themselves. A large chunk of the underspends every year are put into the Capital Reserve, to fund major projects such as the cc£100m Holland Park School. You would think that having large Reserves means you would get some interest on that to ‘soften the blow’ of savings; in fact Council policy states precisely that. You would be wrong. These Reserves are kept almost entirely in the Debt Management Office (very safe but can be accessed quickly), whose return on investments is .25%pa. Given that inflation has been cc2.5%, the loss on say £100m of these Reserves (the sum the Council states they have not earmarked for capital projects) is cc£4-5m/yr. So we are actually LOSING money. If that £100m was invested, we could GAIN cc£4-5m/yr. So you could say that we are forgoing cc£10m/yr. Now let’s look at some of the Council’s PRIORITIES. In 2010/11 (election year) £4.2m was spent on an ‘efficiency dividend’ of £50 each to all registered for Council Tax. In 2013/14 (election year) £7.5m was spent on an ‘efficiency dividend’ of £100 each to all Council Tax PAYERS (ie not in receipt of Housing Benefit). As you can see for yourself, ‘tough decisions’ are in truth IDEOLOGICAL. And people, if the Tories get into government again and are allowed to kick off their destructive ‘deficit balancing’ budget, make no mistake, people will die. Which is why. given that RBKC is a microcosm of all that is very wrong in the country at present, we need to understand how our Tories in RBKC make their decisions, where the money is, and just how the process is driven by wrong-headedness, incompetence and ideology.